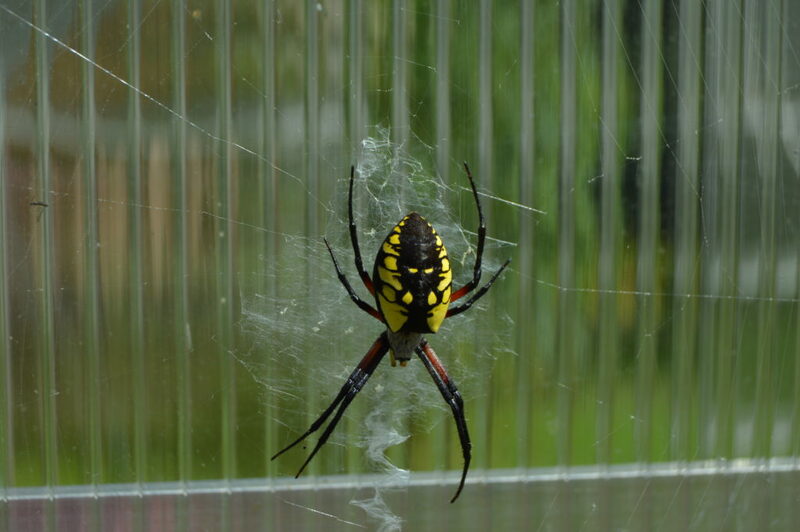 Okay, so I'm not a real fan of spiders but since it is the month of Halloween I thought I'd show you a picture of one that made itself at home on the outside of my greenhouse late August and into September. 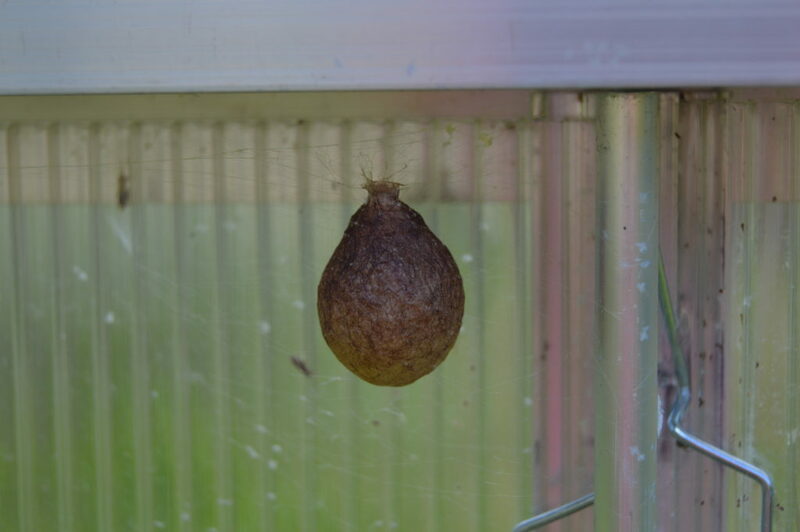 It actually produced two egg sacks. I looked up what type of spider it was because to tell you the truth, it was pretty big and as I said before I don't really like spiders. I didn't do much research other than to learn that they are fairly common here in Maine and hopefully she was eating a lot of mosquitoes. It is so magnificent though how God put the big "face" on the back of the spider to scare away predators. I know it has been a long time since I have added a post. I apologize. Since it has been a couple of months I thought we could revisit some of the plants from the last post just to see the progression of the growing season with the perennials and some other plants around the homestead. 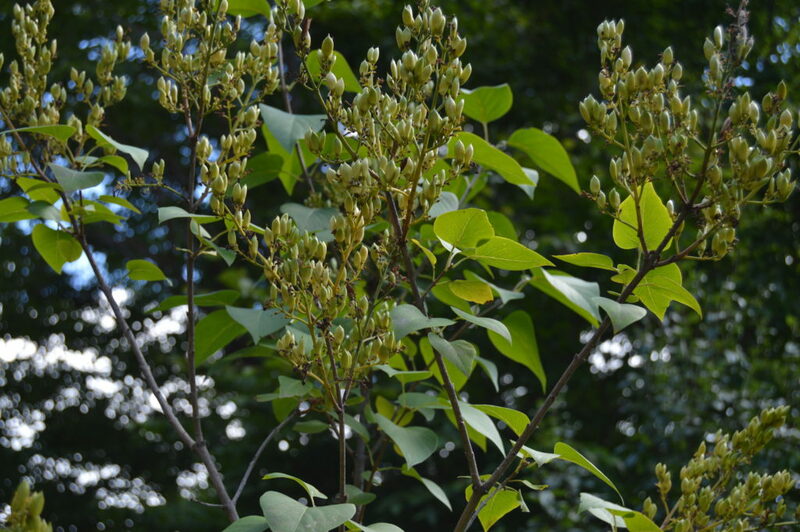 Here is our lilac plant, as you can see it has gone to seed. I think it is pretty in it's own right at this stage. There is just not the heavy perfume in the air as with this plant in the spring. Even though there is no food produced for us from this plant it is one of the first to bloom in the spring and therefore it provided food for our bees as well as the butterflies and other insects. I actually couldn't imagine a homestead without this very old and traditional plant if you can grow it in your area. If you ever visit a old homestead site you might find just the remains of the foundation of the house but you will find the lilac and asparagus patch still growing, amazing. The raspberries were all picked, although it wasn't a very big crop, we had enough to eat fresh. I really need to move the bushes to a sunnier spot but I haven't figured out where that will be just yet. The highbush cranberries have all matured. I waited until after the first frost to pick them. They are in my refrigerator now as I try to figure out what to do with them. Highbush are not exactly the same as the lowbush variety that are grown in bogs and we see made into commercial cranberry sauce. Although I think that is what I am going to do with my harvest. I'm going to look for recipes and see what might be fun to make for Thanksgiving. We got a really great harvest from our grape vine in the front yard. Since I didn't have time to process the grapes we picked them by the cluster and put the clusters directly into freezer bags. Later this fall or during the winter when I have less outside things that need to be done I will extract the juice and make grape jelly with it. This is the first real harvest that we have taken from the grapes. Since we fenced in the front yard the chickens do not get to eat all of them. I'm looking forward to fresh baked bread toasted with grape jelly this winter. Yum!!! 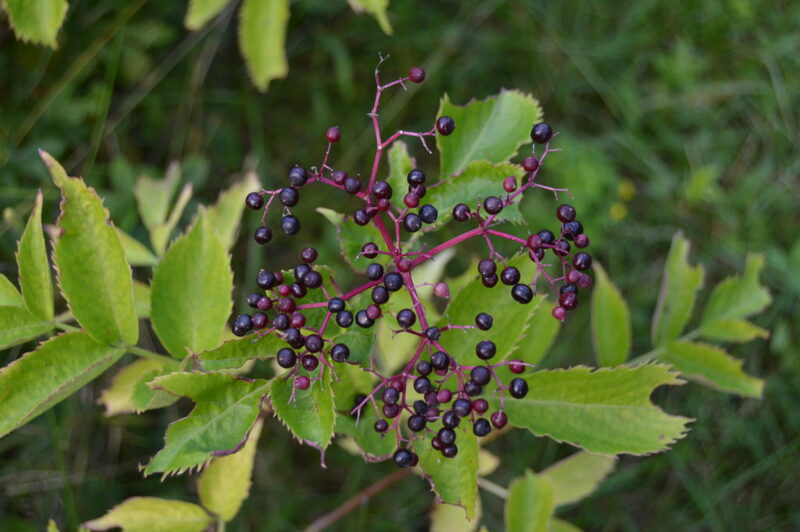 The elderberry are such a beautiful color when ripe. 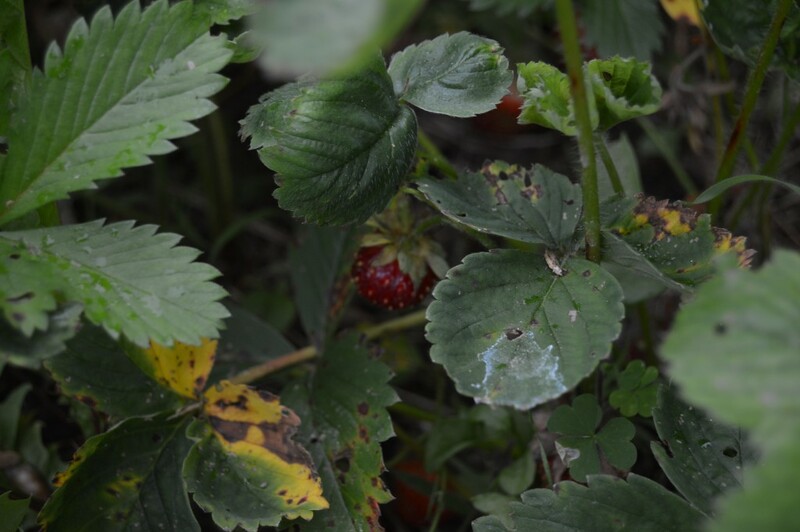 There were only a few clusters on the plant this year and I really didn't know when to harvest and before I got to it the berries matured and fell to the ground. Then I discovered on the side of our driveway a huge wild elderberry plant. It's funny but the plant has been there for years and I didn't know what it was until I compared it with the one planted in the yard. 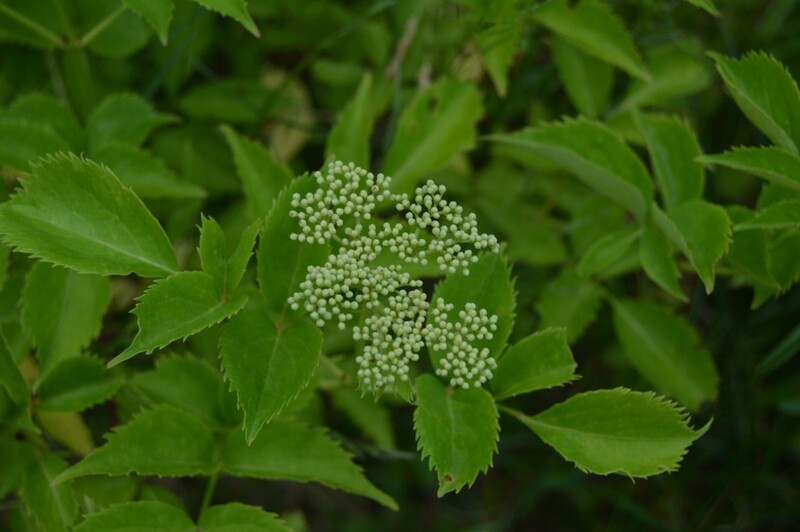 I had read that wild elderberry grew in our area but I hadn't paid too much attention to the plant other than the fact that it had pretty white flowers on it in the spring. 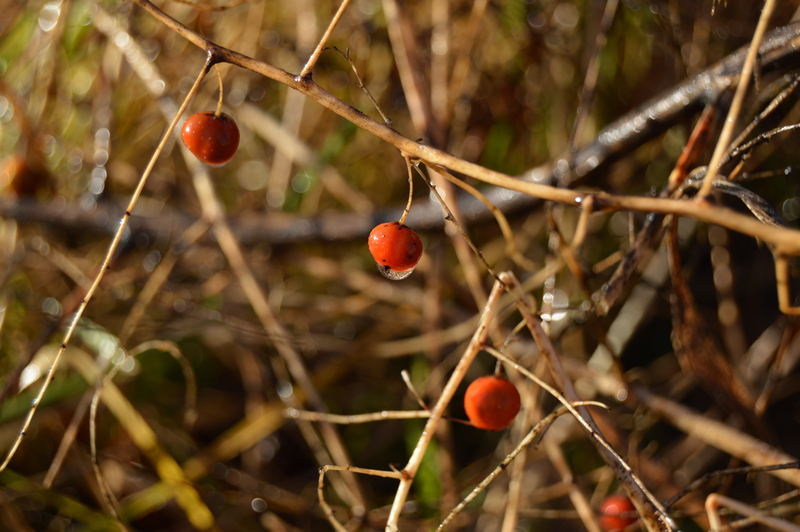 I don't think I even noticed the berries in the fall. So even though we had berries I didn't get any harvested this year. My plan for next year is to dry the berries and have them on hand to make a syrup for general health and to ward off the nasties that can come about during the winter. I'll let you know more when I do that. We had a wonderful harvest of our blueberries again this year. We picked every few days for a couple of weeks to pick as they ripened. I put them in the freezer to use as needed for various baking projects. I like to spread them out on cookie sheets and freeze them before putting them into the freezer bags. This keeps them from sticking to each other which allows me to take out just the amount that I need for my recipe. The strawberries, on the other hand, were terrible this year. It was mostly because I didn't get time to weed them and the weeds won. This is one part of the perennial front yard that I am going to have to revamp. Since I really don't have time to weed a bunch of planting beds I'm going to have to figure out how to keep the strawberries from getting invaded. The best way for this is mulching. I have though about using a weed block product but because of the shape of the beds that I build that would be difficult. I think I am going to reshape the beds to make them more rectangular rather that the curved beds they are now. I also need to revisit the border for the beds. Right now they are bordered with stone which is abundant on the homestead. The problem with stone is that weeds can grow up between them and they are hard to control. I need something more definitive and straight that I can use a week wacker or mower on the outside of to control those weeds. I think I will just go with typical raised planting beds using wood. Just one of the lessons learned. So, my pepper plants love the greenhouse. I have never been able to get peppers to mature for me outside. 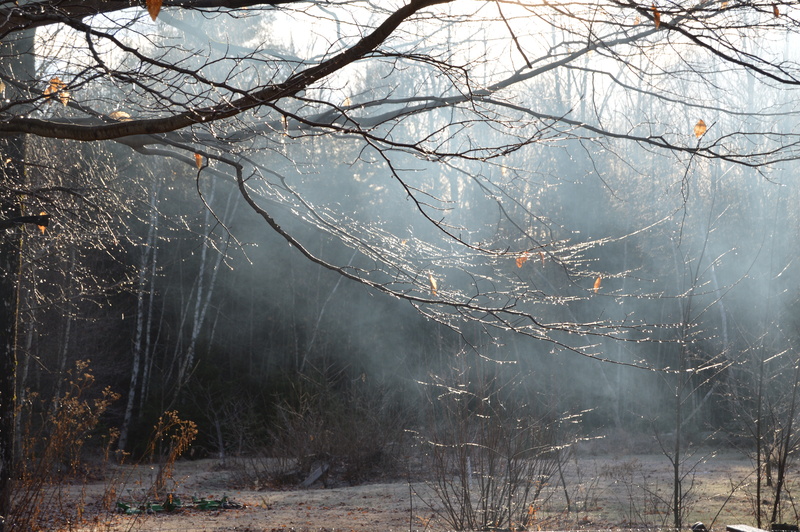 I know many gardeners here in Maine do but I never could. this year my plants have gotten 2-3 feet high and I have a lot of peppers. They are actually still growing since I am closing the door at night. 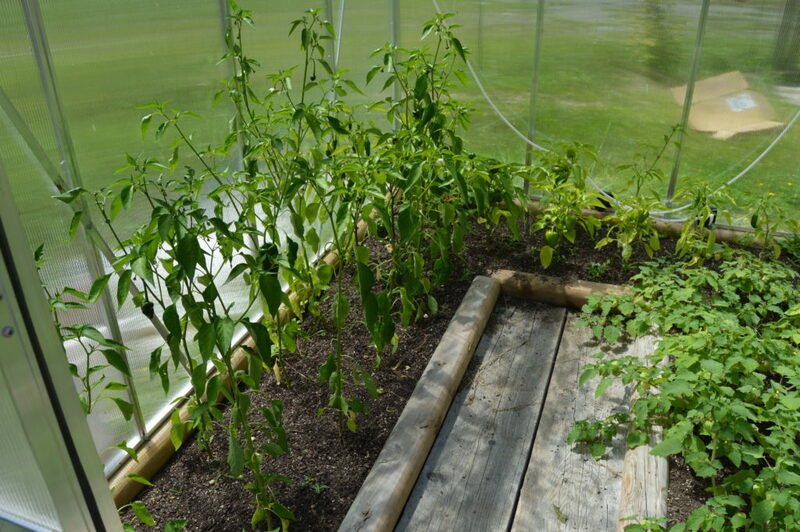 We have gotten a couple of very light frosts but the greenhouse is enough to protect the peppers from that. I am going to harvest soon. Now that I have a good harvest, what to do with the peppers? Some of the hot peppers will get canned to use on nachos and in my Mexican and Southwest cooking. The sweet peppers I am going to dehydrate so I can throw some into soups and stews during the winter. Finally the Anaheim peppers will get roasted before they get canned. If you have ever bought the little can of green chilies in the store that is what they are, roasted canned Anaheim peppers. It is going to be so fun to have all these to use this year. Here are some of the other things that have happened since we last talked. 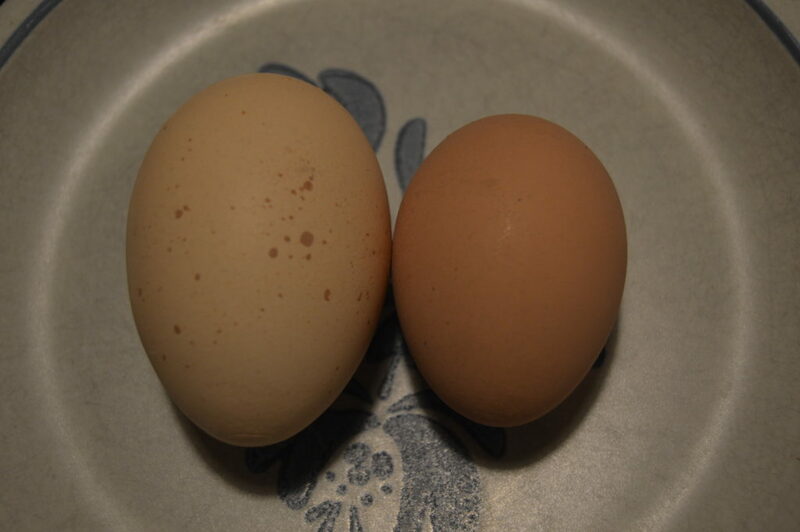 Our new batch of laying hens have begun to lay very cute little eggs. They are small at first and over the next couple of months they will get up to regular size. Our turkeys are growing well. We have put them out on grass for the first time this year. It seems to be working out great. They love to eat the green grass and seeds that they find and I know it has cut down on the amount of feed thet we are buying for them. We will be moving them into the barn soon though because the house that we are putting them in at night is getting to small for them now that they are getting so big. Our beautiful German Shepherd Zoe had to have surgery. She tore a ligament in her back leg and it had to be replaced. Absolutely amazing that they can do that. Our vet, Dr Nesin is wonderful and he took such good care of her. She is doing very well and will have her stitches out next week. Well, I better get to my chores, need to do dishes, hang out some laundry and muck out the turkey house. 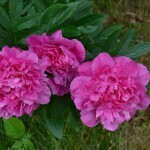 There are so many advantages to having perennials as part of your plantings. We have many different perennials as part of our yard and homestead. The majority of what we grow are either a food or medicinal source. Although I am still studying and learning about the medicinals I have planted elderberry because everything I have read says it is an amazing plant. Even if you are not sure just what you are going to do with a medicinal perennial, if you are interested get it planted. It takes a few seasons for most perennials to get fully established so that you have a harvest so the sooner you get them planted the sooner you will have fruit. Not only do we plant for fruit and medicine we also plant for pollinators. 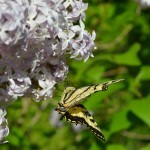 It is important to attract butterflies, bees, and other pollinators to your home and garden. 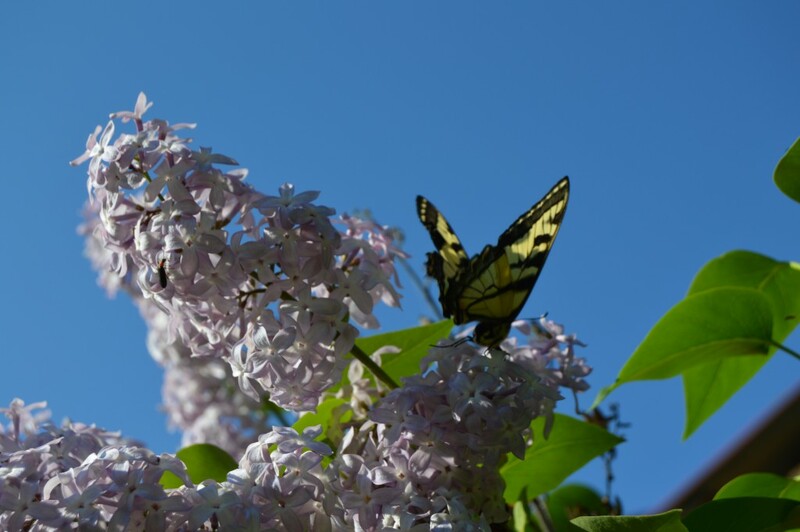 When the lilac blooms in spring there are many insects that flock to it including the swallowtail butterfly you see in the picture above. This one is planted right next to our screened porch and the fragrance is so enjoyable when we can begin to sit outside in the warmer weather. Our front yard, if you want to call it that, is fenced in to help protect the bee hives. It is a fairly small area but it is packed with perennials. It measures around 90 by 40 feet inside the fence. It contains our two bee hives and a 6 by 8 foot greenhouse. The north side of the yard is made up of the side of the house and the screened porch. Along the east side is another fenced area that is the yard for our dogs. Planted along that fence are raspberries. They do a great job of covering up the wire fence. 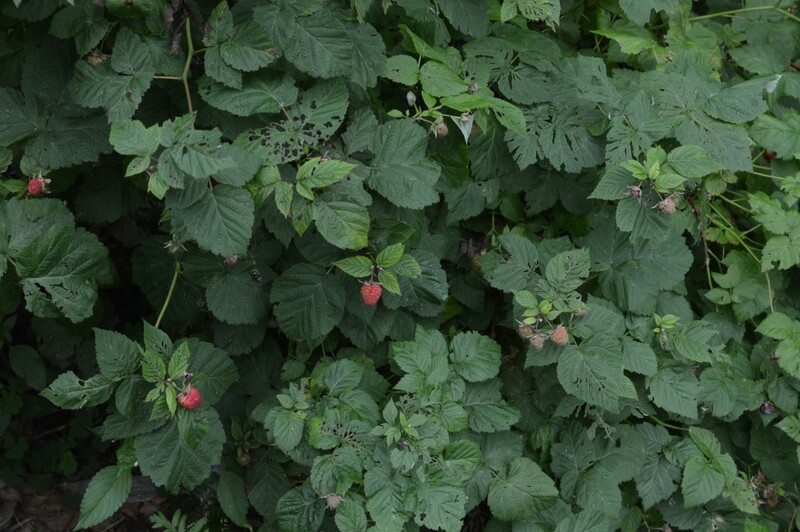 There are only about 8 plants but it is enough for us to enjoy fresh berries during the summer. I also use the berries to flavor my kombucha. 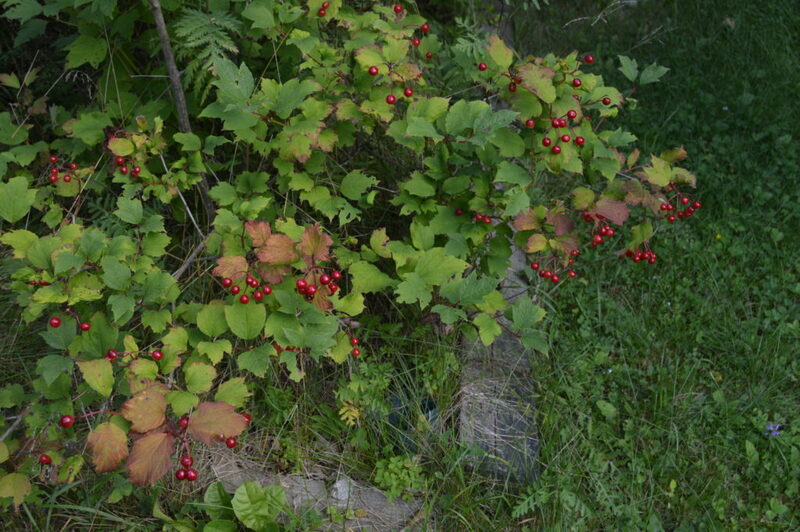 In a raised bed in front of the screened porch I have planted four highbush cranberries. This will be the first year that we get a harvest. It may not be much but it will be fun to cook with then. I'm thinking about a cranberry apple pie in the fall, yum. Cranberries are very good for you also with lots of antioxidants and vitamin C.
Along the house on the north side of the yard facing south is my herb garden. It has been pretty much over run with oregano that was planted more than 15 years ago in the corner. So far I have managed to keep it at bay from a section where I have planted dill, cilantro, lemon balm, thyme, chives, cat mint and several others. I buried tires and planted the mint family members in those hoping to keep them in check. 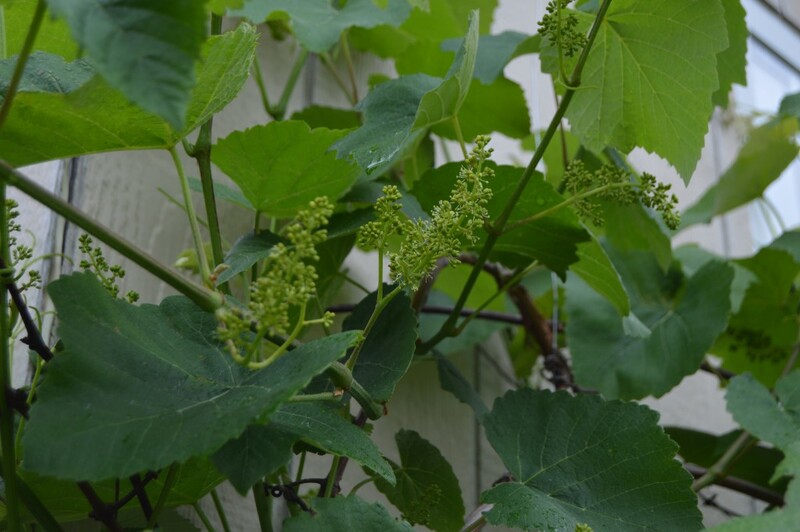 At the north west corner against the fence and house is my grapevine. This has been planted for at least 10 years but was just left to go where it wanted without any kind of support until we put the yard fence up. At that time, a couple of years ago, I put up the trellis wire on the house to encourage it to climb up those. It has also climbed down the west side fence. It is very attractive and the chickens hang out on the outside of the fence under the leaves in the shade. Further down the west fence are planted elderberry, Naking cherries and June berries. These plants are just getting established with this being only their second or third summer. I'm still researching the various uses for these plants. Along the south fence is our blueberry patch. We have 6 highbush plants in a planting bed. We save our coffee grounds and spread them on the bead every few months. 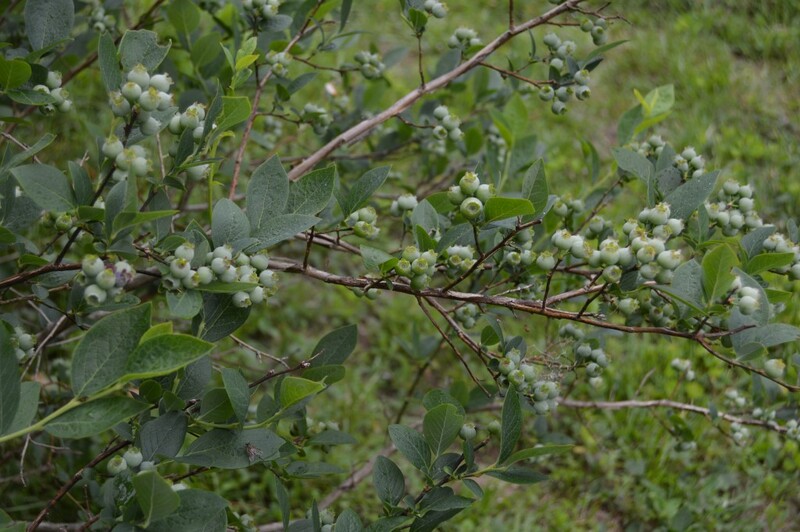 From the look of the plants it is going to be another great blueberry harvest this year. Next to the blueberries are the two bee hives. Now the center of this oasis. There are four planting beds outlined with rocks in the center of the yard. Two have strawberries in them and two have asparagus. The first bed to go in was one of the asparagus. It was planted around 6 years ago before the yard was fenced. Since then I have planted a second bed just because we love it both steamed and raw in salads. The other two beds are for strawberries. Unfortunately one of the beds got over run by weeds which killed the strawberries. I have since weeded that bed, put in weed block fabric and planted more strawberries but they did not grow. I will mulch this bed for the rest of the season and begin again next year with new strawberries. My second bed has become a bit weedy also but I'm working on getting them out of there before they choke out my other strawberries. 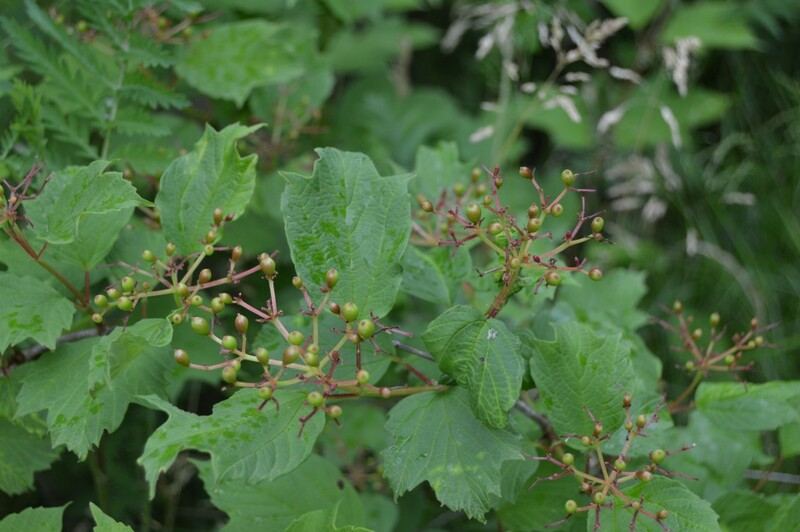 These plants are putting on berries and I'm going to be able to pick some very soon. The small greenhouse is directly north of the strawberry and asparagus beds with a walkway from the screened porch to the gate north of that. 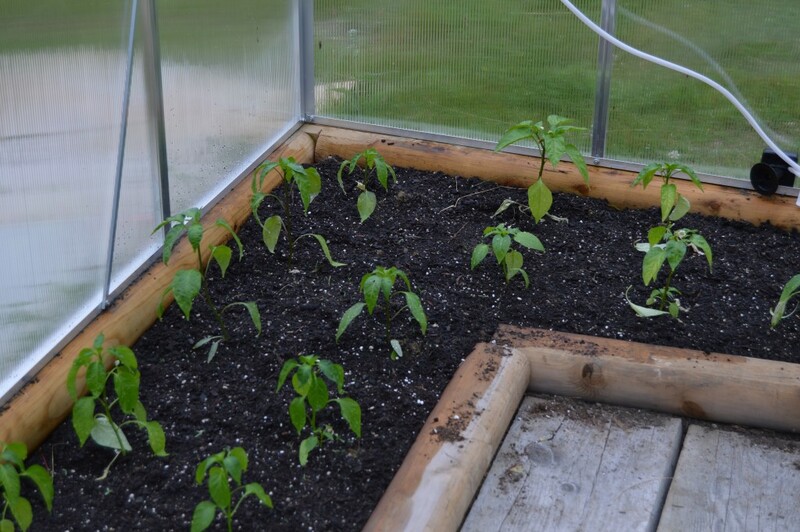 I have finally gotten the greenhouse planted with peppers and ground cherries. I'm hoping that the little extra heat in the green house will be enough that I can finally harvest some peppers this year. I have both sweet and hot peppers planted and have the door and vents open so as not to overheat the space. I am watering everyday since the extra heat seems to dry out the soil quickly and I really want these plants to do well. 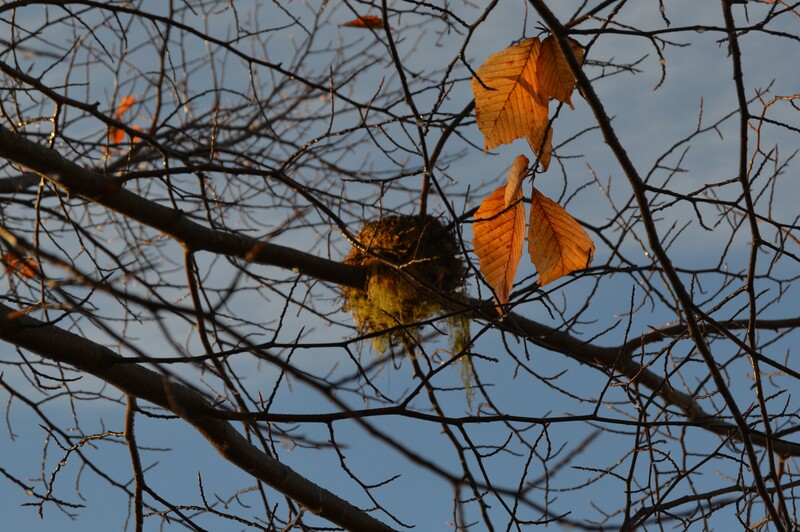 In the corner between the house and screened porch I have a Witch Hazel tree that has been there since the mid 1990s. It was one of the first perennials planted after the small addition on the house was finished. The tiny flowers that you can harvest in the fall have many uses. You can make a astringent from the leaves and bark too. Finally, back to the pollinator attractors. In amongst all the edible perennials are some perennial flowers. Besides lilac there are also three peonies, a bed of dianthus of various colors, which my husband loves, and climbing lonicera, a variety of a honeysuckle. The lonicera climbs up the west side of the screened porch to help shade the area. 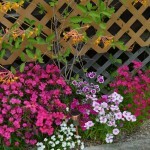 Most perennials require little care once they are planted and established. Some, like the dianthus, peonies, herbs and strawberries die all the way back in the winter and spring up from the ground in the spring. Others, like the cranberries, blueberries and elderberries, their leaves change colors and fall with the season and you have beautiful stem structures throughout the winter. Please consider adding perennials to your yard whether is be in the city or country. There is nothing better than enjoying and harvesting year after year. Published on December 26, 2015 December 26, 2015 Categories Around the Homestead, Homestead ProjectsTags Building projects, chickens, garden, greenhouse, homestead projectsLeave a comment on What Will the New Year Bring??? While it is fall here in Maine and I've been working on getting the garden ready for it's long winter nap the first of my spring gardening catalogs has arrived. I have purchased most of my fruit trees from Fedco Trees in Waterville, Maine. The reason I do is they are grown here in Maine for the most part or somewhere close that has very cold winters. One of the biggest challenges with fruit trees is getting them through winter. I don't have time to baby my trees so I try to order trees that are rated for zone 3 and 4. Fedco has 5 different divisions and their website as well as their catalogs are like reading a text book for the knowledge they contain. I order a lot of my garden seed from them as well since, again, they have great short season varieties. It was a pretty nice day here today so we went to the apple orchard this morning. I have six different types of apple trees planted here but none are producing yet so we still go to the local orchard for apples to make applesauce. This year they put together a bushel with what they call a "applesauce variety". I think there are six different types of apples in it. I have always in the past used at lease two varieties to make my applesauce because it just gives a more full bodies flavor. I am anxious to see how it turns out this year. This afternoon was spent down at the garden. I still have more work to do but it is coming along. Since I put the raised beds in this spring I am not tilling any longer. I still have weeds that thrive but that is mostly because I did not get enough wood chipped to get them mulched before the weeds started. Instead of pulling out the weeds and leftover garden plants I'm cutting them off at the ground and leaving the roots in the soil to rot and give nutrition back. After I get all that done in my three raised beds I want to add a generous layer of compost on top and then cover the whole thing with clear plastic. Using clear plastic allows the sun to bake any weed seeds that may still be lurking in the beds. It will also helps to warm the soil in the spring so I might be able to plant a bit earlier as long as I protect everything from frost threats. I also would like to revive the hoop house that I built about 3 summers ago. The first summer I covered the PVC pipe frame with clear plastic and attempted to build ends for it. 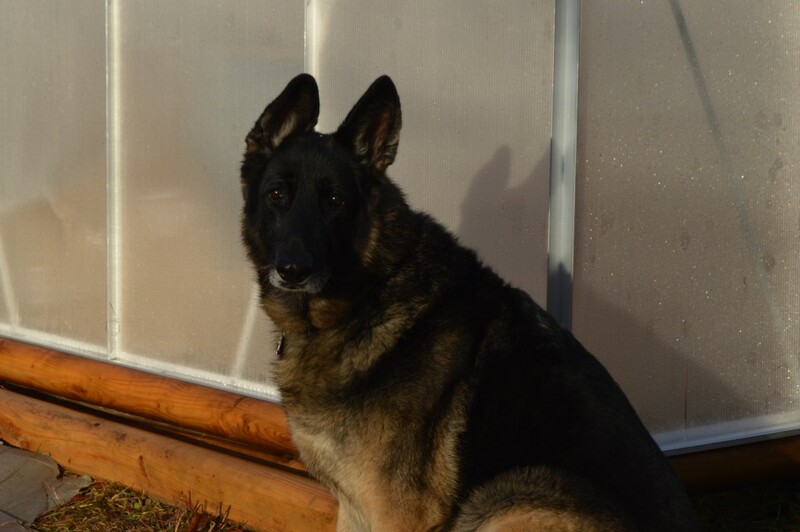 It was difficult to keep the ends covered and still be able to enter the hoop house. I took the plastic off for the winter because I was afraid that the snow load would cave in the structure. I am now toying with the idea of using plastic panels for the sides and ends. The house is 12X20 feet so that gives me a lot of working space. I will add raised beds to the inside of this also. It is just so much easier if you are not walking on the planting surface and compacting the soil. My class on "Getting Started with Chickens" was this last week and several wonderful folks attended. There is nothing like a few chickens and their wonderful eggs. I'll let you know how the applesauce turns out.